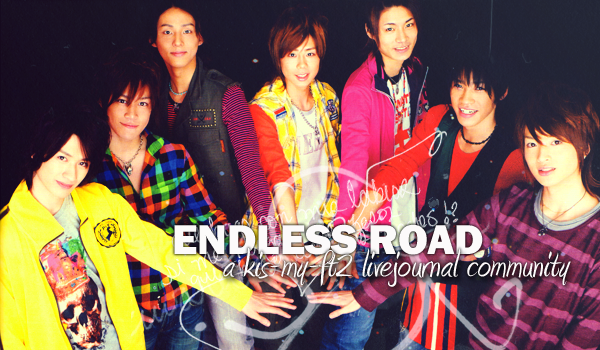 Welcome to ♪Endless Road♪, a fan community dedicated to the Johnny & Associates group Kis-My-Ft2. Remember to read, and follow, the rules after joining the community. It's important that you do so you know about posting, commenting and general behaviour. Rulebreakers will get 3 warnings before a month-long ban. If you've got a question feel free to contact one of the mods, but make sure you can receive PMs from all LJ-user first, or we won't be able to get back to you. Please join kismyshowtime for fanfics, doujinshi and fanart since those are no longer allowed here at Endless Road. If you're looking for graphics and fanvideos then kismygraphics is the place for you. Endless Road only deals with canon. Other useful things can be found in the community sidebar. Kis-My-Ft2 is a group from Johnny & Associates who originally were scheduled to debut in May 2011 but due to the disaster followed by the earthquake and tsunami in March, their debut got postponed to the 10th of August. Their record label is avex but they will still be managed by Johnny & Associates. In 2004 Kis-My-Ft. was formed with the members Kitayama Hiromitsu, Iida Kyohei, Senga Kento, Matsumoto Kohei, Yokoo Wataru, Fujigaya Taisuke and Tomita Mao. However, Matsumoto soon joined J.J.Express, leaving Kis-My-Ft. without its M. Masuda Takahisa (from NEWS) came to perform with the group a couple of times, although officially he never was a member of Kisumai because he was already part of a debuted group. Then Senga joined A.B.C. Jr. and Tomita returned to being a groupless junior, leaving Kis-My-Ft. as a four member group (Kitayama, Fujigaya, Yokoo, Iida). Kis-My-Ft2 was created in 2005 by joining two other units; Kis-My-Ft. and A.B.C. Jr. (Nikaido, Senga, Tamamori & Miyata), making the acronym complete again; Kitayama, Iida, Senga, Miyata, Yokoo, Fujigaya, Tamamori and Nikaido. (The kanji used for 'ni' (二) in Nikaido means '2' in Japanese.) In 2006 Iida Kyohei left the group to focus on his studies but they kept their name and stayed intact since the second letter in Kitayama conveniently is "I". In 2008 the members got their own colours when Fujigaya designed the glittery track suits for the EbiKisu concerts, and after that many of their stage outfits includes their own colours, for example the Inori outfits from PLAYZONE, and even details such as shoelaces, insides of jackets, accessories etc. モテたいぜ　トゥナイト (Motetaize Tonight), LUCKY SEVEN!! ずっと～You are my Everything～ (Zutto ~You are my Everything~), Crush! Crush! Crush!